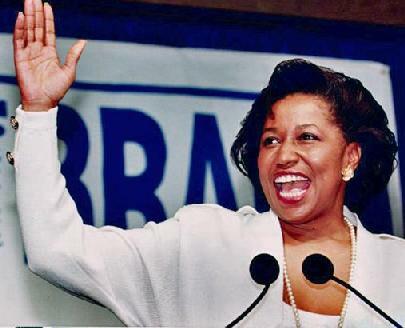 *Carol Moseley Braun, the first black woman ever elected to the U.S. Senate, has emerged as the sole prominent African American candidate in the Chicago mayor’s race after the withdrawal of U.S. Rep. Danny Davis. Davis’ decision, announced at a New Year’s Eve news conference, followed weeks of pressure from many African American leaders who believe that only a consensus black candidate can beat former White House chief of staff Rahm Emanuel and other prominent contenders in the race to replace retiring Mayor Richard Daley. And on Saturday morning, Davis and State Sen. James Meeks, who ended his own run for mayor days ago, appeared at a rally at the Rainbow Push Coalition with the Rev. Jesse Jackson Sr., his son, U.S. Rep. Jesse Jackson, Jr., and U.S. Rep. Bobby Rush to drum up support for Braun. “We believe that our community needed to see some unity … they needed to see togetherness and we need one African American candidate for mayor of the city of Chicago.,” Meeks said to loud applause. Braun who was elected to the Senate in 1992 and who served a single term, faces questions about miscues during her time in Washington and about being out of the spotlight for years. But in recent days she had emphasized her profile in Chicago and beyond, better support in the city’s business community, and her likely fundraising advantage over Davis. Carol would be an excellent choice for mayor…Go CMB!!!!! Anyone except that Blue Dog obstructionist Rahm Emanuel. Exactly! I can’t believe polls show Rahm in the lead…for now!